If they cancel after 30 days prior to the arrival, we charge teh first night. 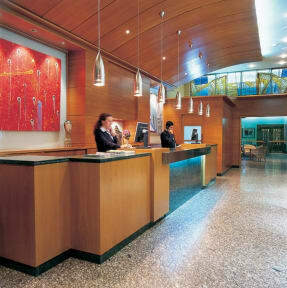 The uniqueness of the Hotel Corona de Castilla is based on the feeling of well-being that we propose, thanks to the importance of the human factor and functionality of its services. 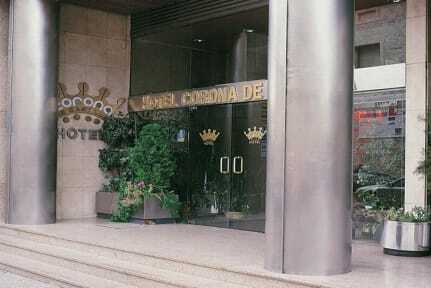 For its central location, a famed service banquets and events, and its comfortable rooms, we offer it as your best choice to enjoy your stay in Burgos.Whether your visit is for leisure or for business, the hotel invites relaxation and rest, thanks to the friendly treatment and the cosy atmosphere. Well communicated, near the Congress Palace and the bus station. We have parking which cost 13.50â'¬, which makes us the perfect base from which you can easily explore all the historic and commercial area. Our 87 comfortable rooms are fully equipped with air conditioning, satellite TV and Canal +, radio, piped music, minibar, safe, free WiFi, full bath and hairdryer. My daughter & i had been walking on the Camino De Santiago trail for two weeks - staying in albergues, mostly in bunk beds with many other people. We really enjoyed "splurging " in Burgos and staying at your MOST COMFORTABLE hotel. We recommended it to many other friends on the Camino. Gracias ! !